After finally finding out what “OOTD” stands for (Outfit Of The Day), I’ve started to enlist my co-workers to help me document some of my fave outfits. 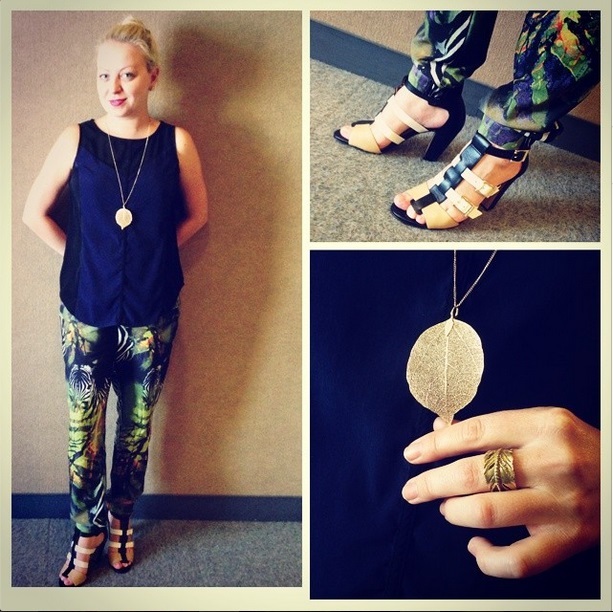 For my first OOTD collage, I had to feature my safari print pants. I got these from Top Shop last year, and although I was a little shy to wear them at first, now I absolutely love them for any occasion. My shoes are Vince Camuto, a brand I’m currently obsessed with. I’ve bought three pairs of Camuto shoes in the past six months, and I’ve already had my eye on some of his pieces in the Nordstrom Anniversary Sale. I saw this pair of sandals at DSW and left without buying them, but I kept thinking about them so went back after a long Monday at work to scoop them up. Since then, they’ve proven to be really versatile, and a great buy! Lastly, I had to include a shot of my gold accessories (by gold I mean gold-colored, not actually gold). I’ve gotten so many compliments on that gold leaf necklace, and I love how it’s so delicate and thin. But, to most people’s surprise, it’s actually a super affordable necklace I bought on impulse at Aldo for $10. The brass ring is something I got at a stand at the Randolph Street Festival. Sure, it turns my finger a bit green at times, but I really like the feather design.